Police in Bangalore, India struggled to stop a crowd of men from groping and yelling lewd remarks at women gathered to celebrate New Year’s Eve due to the sheer number of molesters involved, according to local media. 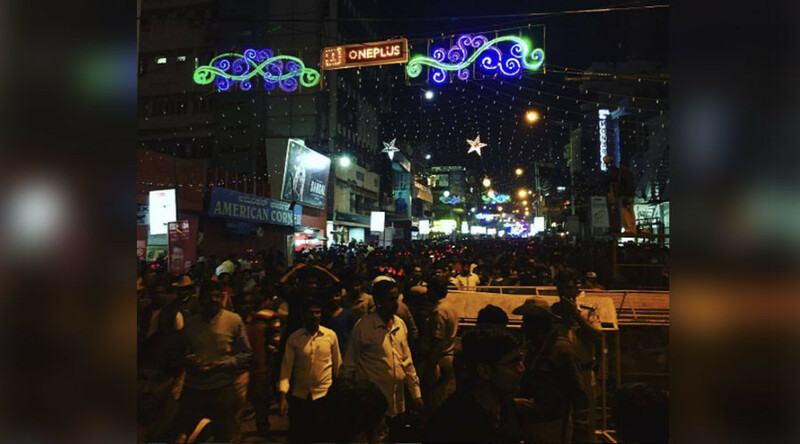 The celebrations in Bangalore were attended by several thousand people with 1,500 police on duty, according to the Bangalore Mirror. The Mirror, who had photographers on site, claimed women were forced to “take off their stilettos and run for help” after a crowd of men began molesting them. Initially no action was taken by police who claim they were unaware of any molestation on the night. “We got around 450 calls at the city control room when on Saturday night, especially after 10 pm till wee hours in the morning, and not even one was about women being assaulted or molested,” deputy commissioner Nagendra Kumar said. Later they changed their stance, however, with police director Om Prakash saying that those involved in the attack would be identified and actions taken against them. Footage from more than 25 security cameras in the area is being examined. The state's Home Minister, G Parameshwara, said there were plenty of police on patrol and women weren’t in danger, adding that “western ways” adopted by the youngsters involved were to blame, according to the Indian Express. "Youngsters who are almost like westerners, they try to copy the westerners not only in the mindset, but even the dressing,” Parameshwara said. The #Bangalore mass molestation news is very upsetting. I've been trying to process it all day. How can this happen in Bangalore? Mass Molestation of Girls on Street of Banglore! No head line in Media! No Sikulars or Libtards barking coz it's a Congress governed State?! Allegations of such incidents have caused much anger and outrage towards police. “I think the culprits should get caught and punished and that should be made an example. I think young men need to be educated on how to behave,” one local told the Mirror.